This past week I had a flight path out of Sky Harbor International Airport which crossed over Arizona Loop 101 on the border of Scottsdale and the Salt River Pima-Maricopa Indian Community. 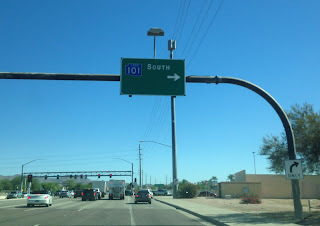 - From I-10 northeast to I-17 the path of AZ 101 is known as the Agua Fria Freeway which is named after a West Valley River. - From I-17 southeast to AZ 202 the path of AZ 101 is known as the Pima Freeway. The above picture is from part of the Red Mountain Freeway segment of AZ 101. The Pima name comes from Pima Road and the namesake reservation. - From AZ 202 southward back to AZ 202 the path of AZ 101 is known as the Santan Freeway. In the original planning stages AZ 101 carried the designation of AZ 417 for the Agua Fria Freeway section and AZ 117 being part of the Pima/Price. AZ 101 was legislatively defined in 1987 as a Loop Freeway of the Phoenix Metro Area. The original segment of AZ 101 to open was along the Price Freeway which was originally designated as part of AZ 202. AZ 101 was fully completed by the turn of the century in the early 2000s with a segment from Tatum Boulevard eastward through Scottsdale. My personal experience along AZ 101 was mostly along the Pima Freeway corridor given that I was mostly living in the East Valley in the 2000s. In 2006 the City of Scottsdale introduced Photo Enforcement which was subject to controversy. The reasoning behind the Photo Enforcement was due to the high fatality rate along the Red Mountain Freeway. It quickly became suspected by many (myself included, hence the personal opinion) that the City of Scottsdale was more interested in additional funding by calibrating the Photo Enforcement Towers to 11 MPH over the limit rather than safety. Some of the ticket revenue was given to local company Red Flex to process the photo enforcement tickets. In 2010 Photo Enforcement of the Pima Freeway in Scottsdale ended, the rest of the city largely followed. AZ 101 along the other Phoenix Loop Freeways originally had colored shields. In the case of AZ 101 the shield color was blue, I have one in my personal collection. The blue AZ 101 shields were largely replaced with black and white variants in the 2000s. Blue AZ 101 shields can still be found on several surface streets such as McDonald Boulevard and Shea Drive in Scottsdale. The shield below is from Shea Boulevard heading eastbound at the AZ 101/Pima Freeway interchange. L101 in Tempe/Chandler is actually the "Price Freeway."